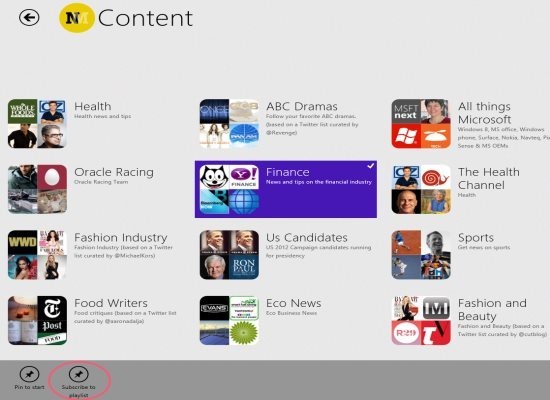 NewsMix is a free social media Windows 8 app available under the ‘News & Weather’ category of Windows 8 Store. 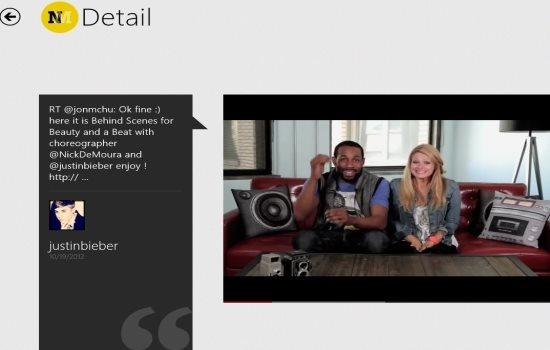 Here, in this Windows 8 social media app, you can discover what is being currently shared by people via social media. They can be journalists, celebs, experts, politicians, singers, musicians, or anyone who has something to share on the topic of his / her interest. 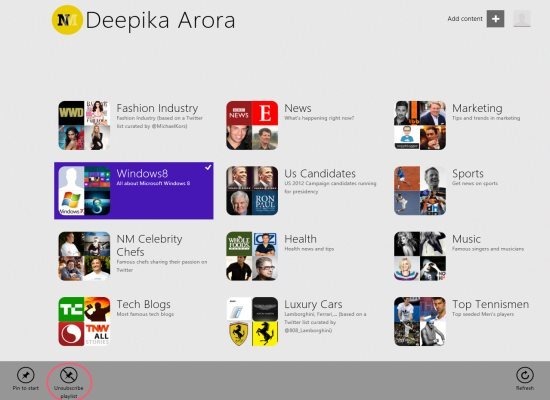 The News in this news Windows 8 app have been divided into various categories such as Health, Restaurants, Finance, Tech Blogs, Sports, Fashion Industry, Marketing, Neuroscience, and many more. The interesting part here in this social media Windows 8 app is that you can create a personalized playlist, organizing news extracted from all the social networks or various other sources of information. You can add topics of your interest in this personalized playlist. It lets you play or read only about your own topics of interest. The videos are embedded in YouTube, hence it does not takes you to YouTube website to show you the News video. You can watch it directly in the app. You can subscribe to over 2000 personalized News playlists. However, in order to create a playlist, you need to sign up with the app. As you open the app, you will find an option to ‘Create or Sign In’ to the app. If you are browsing through the app for the very first time, you need to create an account. Just click on that option ? this will quickly open a horizontal panel at the right-side of the screen. Enter you credentials and click on ‘Validate’ to end the process of creating an account. Soon you will find yourself logged into the NewsMix account. You can add content to your personalized playlist. Also, check out other similar apps: History App, Astronomy App, Video New App. Once you have created your account, sign in to it, this will open your personalized page. Click on ‘Add Content’ given at the top right-side of the screen to add more categories. This will open all the categories that NewsMix has in its store. Now, to subscribe for a particular category, just select the desired category by clicking right on it. As you click , you will find a horizontal panel opened at the bottom with options like ‘Pin To start’, and ‘Subscribe To Playlist’. Click on ‘Subscribe To Playlist’ and soon the category will be added in your list. Similarly, you do subscribe for a number of categories easily. However, in case you want to unsubscribe a service, follow the below given simple steps. Simply go onto your playlist. Select the category that you want to unsubscribe, by right clicking on it. Click on ‘Unsubscribe Playlist’ given inside the opened horizontal panel. There you are.. it’s already unsubscribed. Go onto the Windows 8 store. Press ‘Win+Q’ to get the search bar. Type ‘NewsMix’ and Enter to retrieve the app from the store. Yup.. it’s there now, open it. Click on ‘Install’ option to download the news app now. Its done.. start using it. In short, NewsMix is a very nice social media Windows 8 app that lets keeps you informed about all the content shared on social media related to different categories. Go ahead and download NewsMix now.